"Both speakers and Members provide valuable insights and trigger deep and broad discussions and follow-up explorations." "I love these meetings. Being able to see and hear what is on others minds is invaluable." "ABL is an environment that always provides great (and current) information and makes me think. A welcoming group of very smart, committed and terrific people." "The primary benefit is the education, timely information, and varied perspectives that are shared by high-level healthcare industry leaders. " "ABL is like being in an Executive MBA class at Wharton, except it’s a little bit better, because it’s really just all the professors talking about the problem." "ABL is a wealth of information, knowledge, and camaraderie. You really get to trust the other Members, and you become more than business associates that meet once a month – you become friends." "ABL allows me to get out from the day-to-day tasks, responsibilities and issues to focus on the BIG picture." "One of the most valuable aspects of ABL is the broad perspective of what’s happening in the industry." 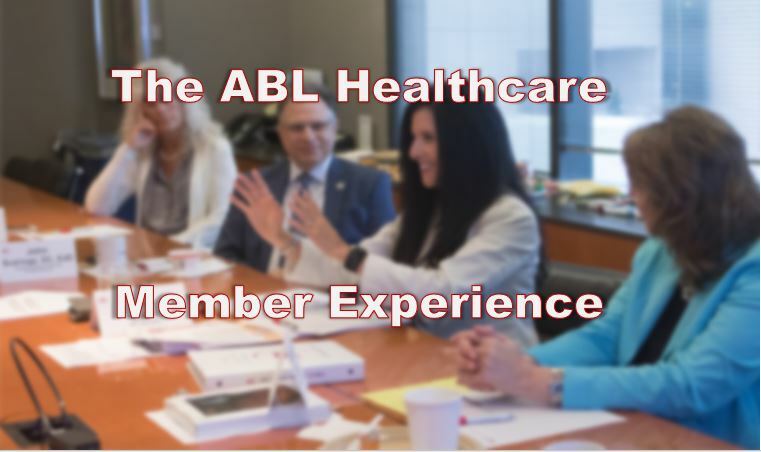 "ABL provides exposure to relationships with a “brain trust” of knowledgeable, thoughtful & innovative leaders in the healthcare world. Both speakers and Members provide valuable insights and trigger deep and broad discussions and follow-up explorations." "After the first meeting I was sold. With healthcare reform, the word is partnership – more than any other time in the history of my career – partnerships, partnerships, partnerships." "What I really like about ABL is the chance to bounce ideas off of other people and see their reactions to the various issues that I am facing in my healthcare business." "ABL provides an excellent opportunity to share knowledge and expertise on the most current issues in the healthcare industry." "ABL has made me a more thoughtful and effective leader in my business. ABL's brought my attention to important ideas that are circulating in other sectors of healthcare that we can put to work." "I learned so much in my first experience with ABL! What Talent!" "I rarely miss ABL; this is where I get my Brain Food. It helps to keep my day-to-day decisions in a larger perspective." "ABL gives me an opportunity to get input from a cross section of healthcare leaders." 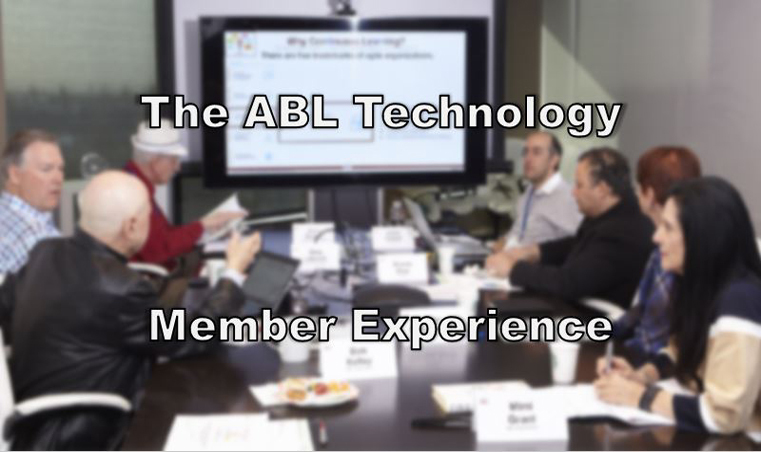 "ABL Round Tables help me to stay informed in this era of remarkably rapid change in healthcare service and payment." "I’ve been a Member of ABL for over a decade. It’s a terrific organization for healthcare leaders who want to accelerate the process of creating valuable organizations." "The networking with leaders and socializing with brilliant people is just a fraction of the benefit I get out of it." "The draw for me is the ability to connect with people who are grappling with the challenges that we face in healthcare and an opportunity to bring your problems to a knowledgeable group of people and get good advice and counsel." "Great discussions and networking. Thought-provoking dialogue - challenging insights." "ABL can really be life changing, thank you for making it possible. I can’t believe how much I learn from all of you. Mimi should hand out diplomas!" George Carpenter, CEO, MYnd Analytics Inc.
"I value the chance to step outside of my networking environment to gain new ideas and perspectives from leaders in the health field." "I find the broad range of healthcare services and products represented by the Members to be very valuable. I also appreciate the broad range of topics that make me think." "I find the networking and attentive perspectives from people with different stakes in the system to be very valuable." "Setting aside time from my daily responsibilities at the office that allows me to learn and think about trends in the industry and how they may influence or impact my organization." "I got my MBA at university and my PhD at ABL. Some of my closest friends are people I’ve met at ABL. It has opened the door to parts of the Healthcare world that would have been closed to me!" "I learn something new that’s relevant to my field development at every meeting. It’s like a think tank family." "I’ve belonged to a lot of organizations, and ABL is, hands down, the best." Adam Miller, President and CEO, Cornerstone OnDemand, Inc.
"I see ABL as finishing school. I got my undergrad [at Harvard] and never went back, so this is definitely a continuation of my education." "I've been able to use my fellow ABL members as partners and as an informal board of directors, and the Round Tables keep me current on best practices and trends. In all, ABL has been wonderful to me." "When I first looked at the price tag of the Round Table annually, I thought, Wow, that’s kind of a lot of money. Now my perspective is that is a drop in the bucket, compared to the value received." "The best thing for me about ABL is the learning that takes place. I enjoy listening to problems my colleagues are facing and then what kind of solutions are there to deal with those problems." "I probably would have to pay 16 consultants to get the kind of great information I get from the Round Tables and the people in my group." "ABL is the best business meeting series I have ever attended. It is a professional organization for CEOs and Presidents, where the Members bring the real day to day business cases to the meeting and share opinions and solutions. I do my best to participate every meeting I can." "ABL has been a great pay-off for me and I have found great value. It has brought me help in financing the company, resolving financial issues, and customer problems. And it’s served for personal growth, too." "ABL allows you to set aside everything else and really just listen, interact, and think about a whole completely different set of issues than you will on a day-to-day basis." "The big thing that ABL provides to us is that it’s companies of like interests, as opposed to other types of groups that have CEOs with maybe very divergent interests." "This group of fellow executives is ready to share and solve your problems of the month, or share theirs with you to better inform you of those you might otherwise miss in your management life. It is certainly worth the time and effort to hone your skills at becoming an Adaptive Business Leader." "I've been a Member of ABL for the last 10 years. ABL has given me a good group of more experienced executives who've walked in shoes that I am about to walk in." "The best thing for me about ABL are the great people in the Organization. It’s a caring group of people, they are very open in sharing their own problems, and that leads to an environment where you can share your problems back. And they’re non-judgmental. They’ll give you the best advise they can. You can take it or not." T"he most valuable aspect of ABL for me is the mentoring and access to a century of business experience, with like-minded knowledgeable people." "ABL has been great. It has really helped me in being able to work with start-up businesses and be a very effective entrepreneur - without all the support you get from an 85,000-person company like General Motors." "I find the guidance and feedback of other Members very valuable, as well as the views of other businesses."